Download the Midomi application to your phone. Just hold your phone up to a speaker, and Midomi names the tune in as little as five seconds! It even works if you sing or hum the melody. You can also instantly check out a song or band just by typing the name. You can share a song via e-mail, buy it, or check out lyrics, videos, and artist info for free. With Midomi's search and music browsing, you and your friends will get in touch with music like never before. 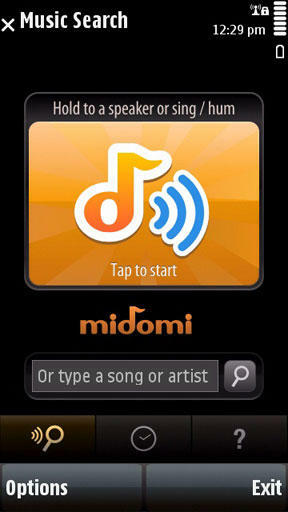 Midomi Music Identifier is powered by Melodis' own Sound2Sound Search Science. Or go to the Store on your phone and search for "Midomi"